Arriving in Madrid I was greeted by brilliant winter sunshine. As I stepped onto the train platform, I felt the chill of the crisp air, but it was also carrying with it that electric hum of energy that one only really feels in big cities, writes Andrew Forbes. I was excited to be back in Madrid and this time, to be on my way to the very centre of the metropolis, to the iconic Gran Via, probably the most famous street in Spain. The NH Collection Madrid Gran Via opened last year, and I had been invited to take a look. The first thing that strikes you upon arrival at this 4 star, 94-room property, is the hotel’s striking architecture. The NH Collection Madrid Gran Via is within a beautiful century-old neo-baroque building. 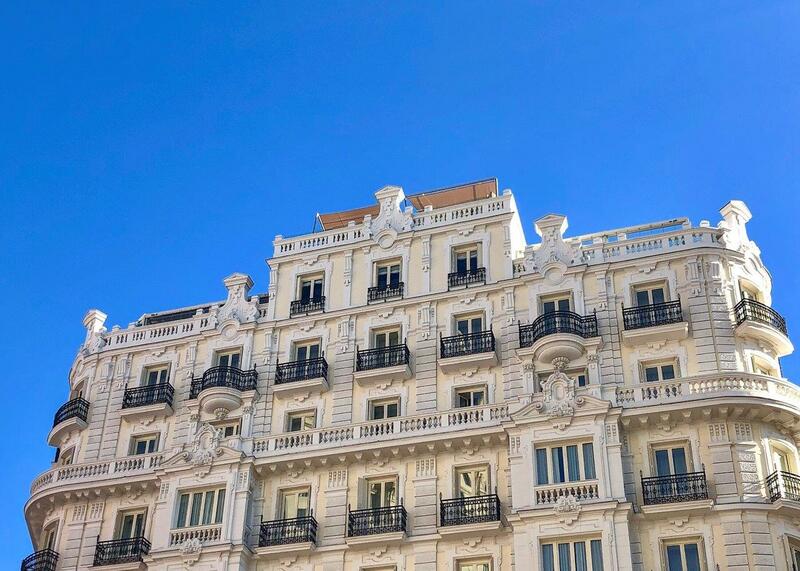 Now restored and sparkling white, it is one of the landmark buildings on the Gran Via avenue. 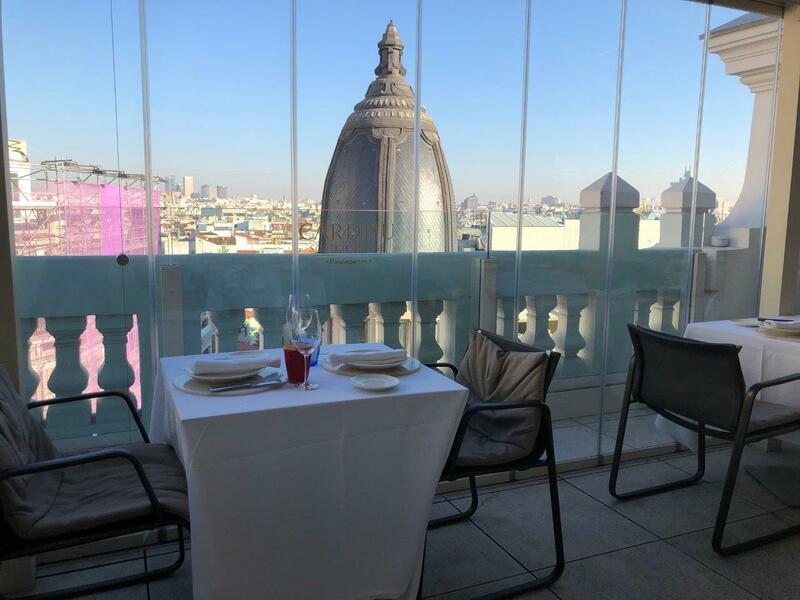 The orientation of the hotel means that many of the rooms (a selection from all three categories – Superior, Premium and Junior Suites) have privileged views of the Gran Via, and the city centre skyline. Free Wi-Fi is throughout the hotel; and for business travellers or those looking to download content or send large files, there is the option for superfast Wi-Fi too. 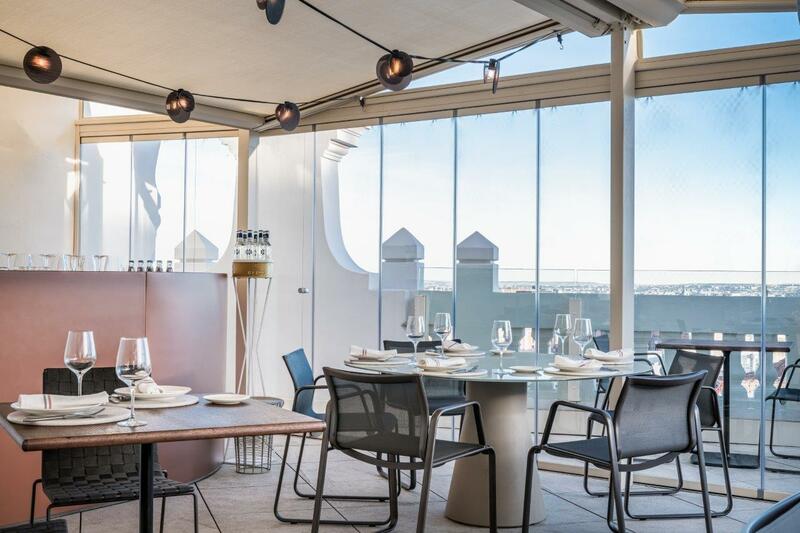 The 8th floor ‘Picalagartos’ Sky Bar and Restaurant is an all-year city centre destination for dining, cocktails; plus, a fine collection of malt whiskeys at the Cardhu Scotch House bar; and gins at the summer Tanqueray Sky Garden. The 9th floor roof terrace promises 360-degree panoramas – it’s open from spring to autumn. 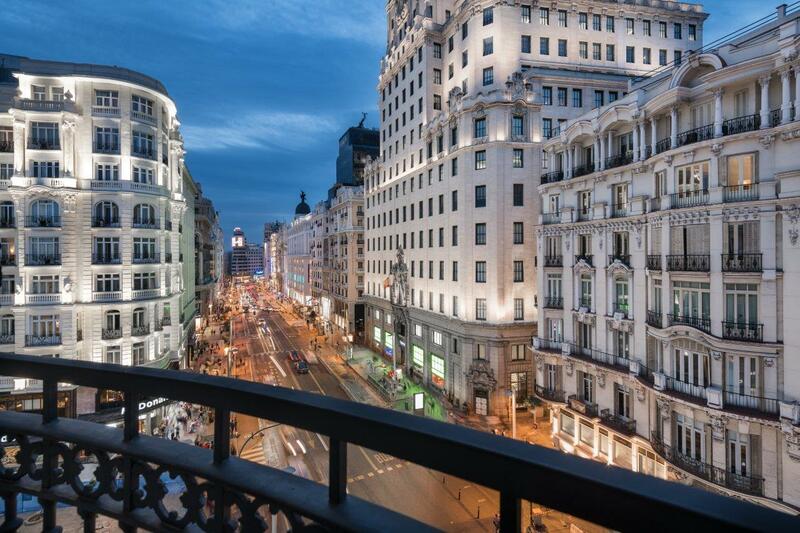 Staying at the NH Collection Madrid Gran Via, you will have Madrid at your feet. 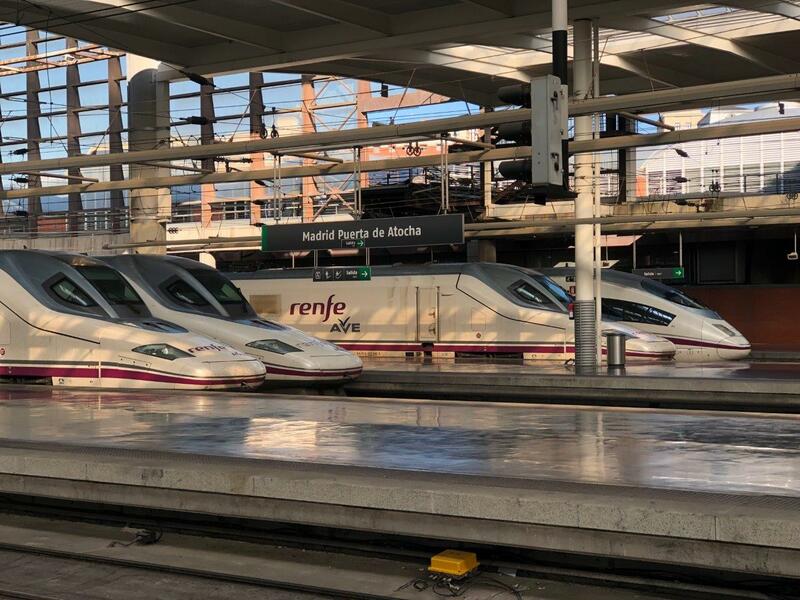 The hotel is about half an hour from Barajas International Airport; and less than 15 minutes’ taxi ride from Atocha train station, (if like me you arrive on the super-fast intercity AVE train). Thanks to its central location, many of the city’s cultural, gastronomic and tourist attractions are within walking distance. 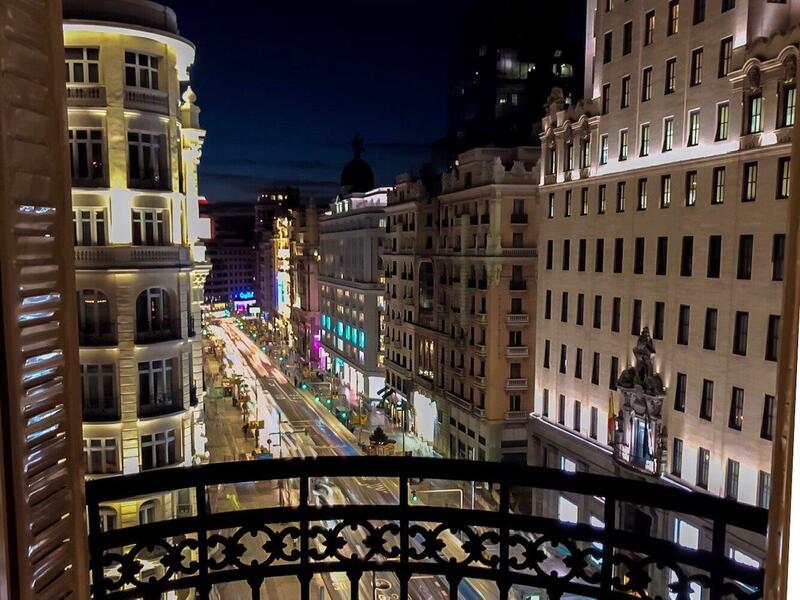 The Gran Via is home to flagship stores; whilst the surrounding streets are full of history. Within a few mimutes’ walking I discovered San Antonio de los Alemanes church, just full of mazing frescoes! The on-trend neighbourhoods of Chueca and Malasaña are close by, and the museum quarter is about 15-20 minutes’ walk. Madrid, at the heart of the Iberian Peninsula, is well positioned for combining with other travel across Spain. This historic city of Madrid is built in the very centre of the country, a natural hub. In fact, it has emerged as the go-to city break destination of recent years. No longer overshadowed by designer Barcelona; the Spanish capital is attracting travellers looking for a more authentic flavour of Spain, without the challenges of over-tourism. 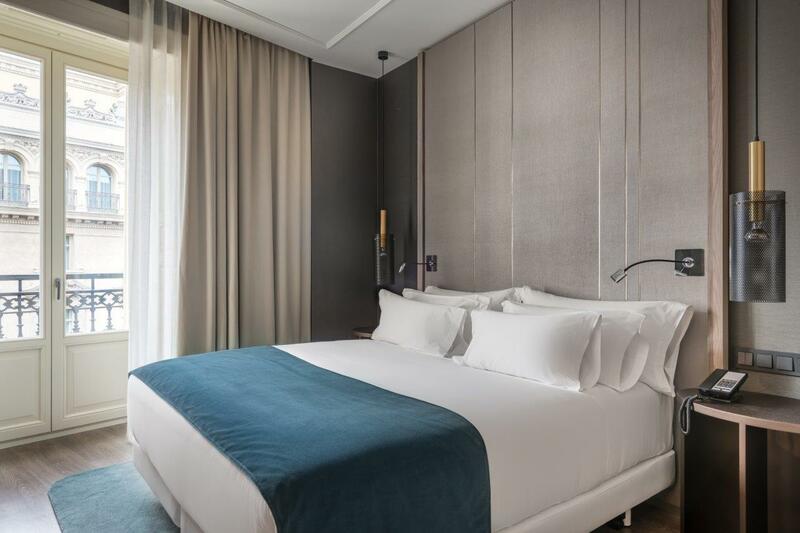 The NH Collection Madrid Gran Via is part of the new wave of hotels that have recently opened to cater for business and leisure travellers looking for style, location and fair rates. The ornate, classical exterior of the hotel gives way to an elegant, understated contemporary interior. 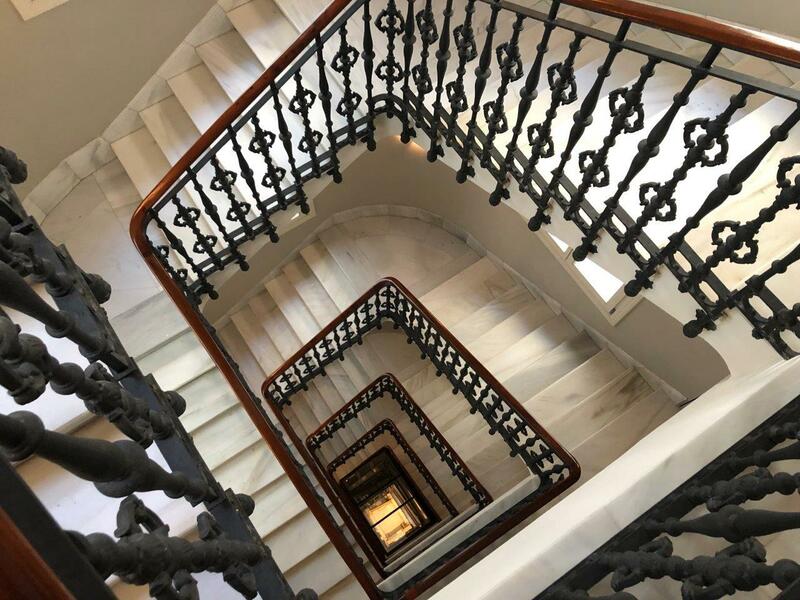 The grand marble staircase with its ornate ironwork balustrades has been restored, but the main spaces and guest rooms have a modern edge, with muted shades light brown, beige and grey – with accents of aquamarine and the NH signature burgundy; and bold artwork. The team set the tone with a relaxed and friendly professionalism. On the ground floor one is welcomed by staff at a small podium who usher you to one of the lifts that take you to check-in on the 8th floor. There are seats at the front desk, so you can relax, and enjoy a refreshing drink whilst formalities are taken care of. 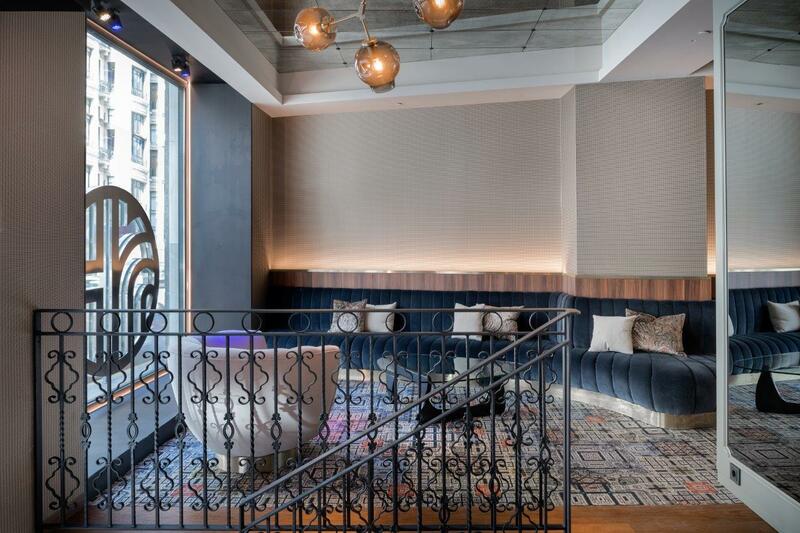 The restaurant and bar attract a city crowd, creating an urban buzz. This doesn’t feel like a tourist hotel at all – you feel at the centre of things, surrounded by Madrileños. The first think I noticed was the tranquillity in the rooms. One might be overlooking one of the busiest thoroughfares in Spain, yet the sound-proofing was excellent. In addition, the bedroom area can be closed off from the living area thanks to a sliding door. What’s more the glazed windows also have period style wooden shutters, so the room is completely dark at night. The outside corridors are carpeted and well insulated, so I wasn’t aware of any noise from other guests coming and going. But maybe that was also because I slept so well on the super comfortable mattress. Linens are soft and the bed was set with three types of pillow, with various weights and thicknesses, so didn’t need to ask for alternatives. 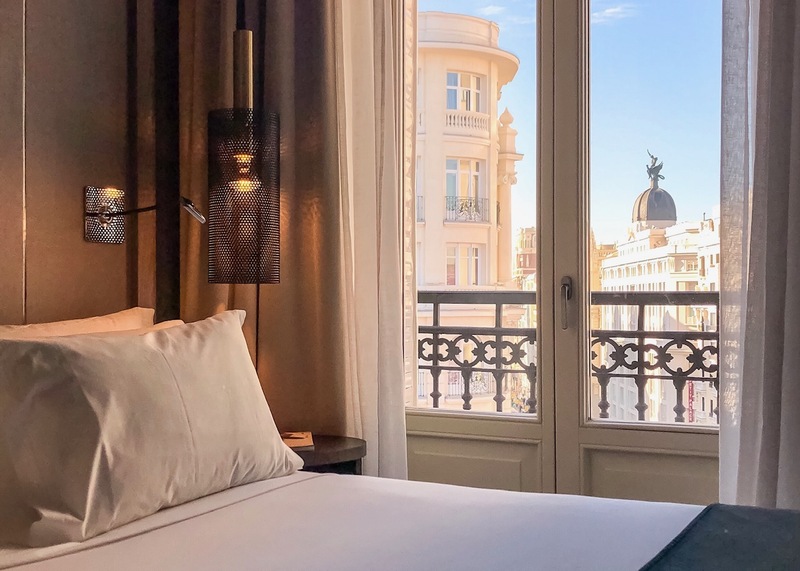 This guest suite has French Doors in both the guest room and living space that open onto balconies affording exceptional views of the Gran Via, the striking architecture and even the mountains beyond. Décor has contemporary styling, in wood and chrome. There are large LED TVs in both the bedroom and living area, with interactive services. I was very pleased to see a desk – so often a space to work is forgotten by contemporary hotel designers in their pursuit for visual impact. This suite was comfortable and functional. Electrical and USB sockets were all easily accessible above the desk and night stands. 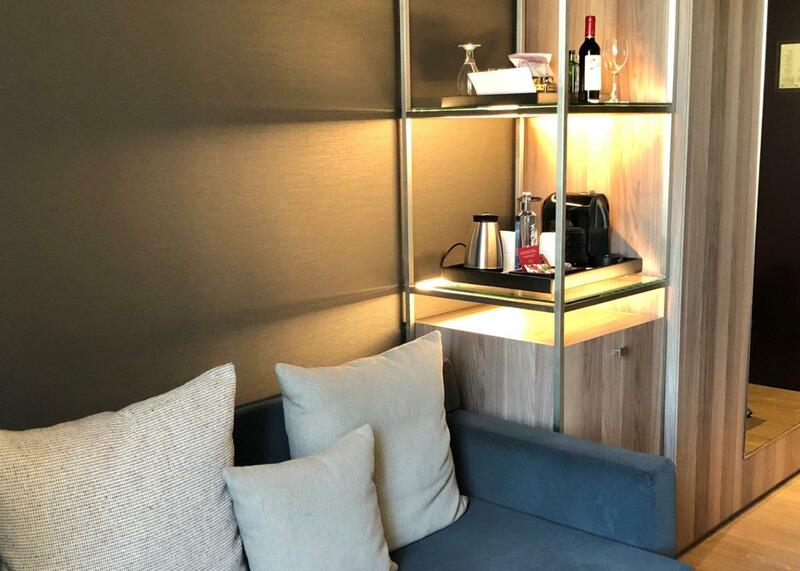 The mini bar included a Nespresso Coffee machine and kettle with a complementary selection of capsules and teas – and a free bottle of water. 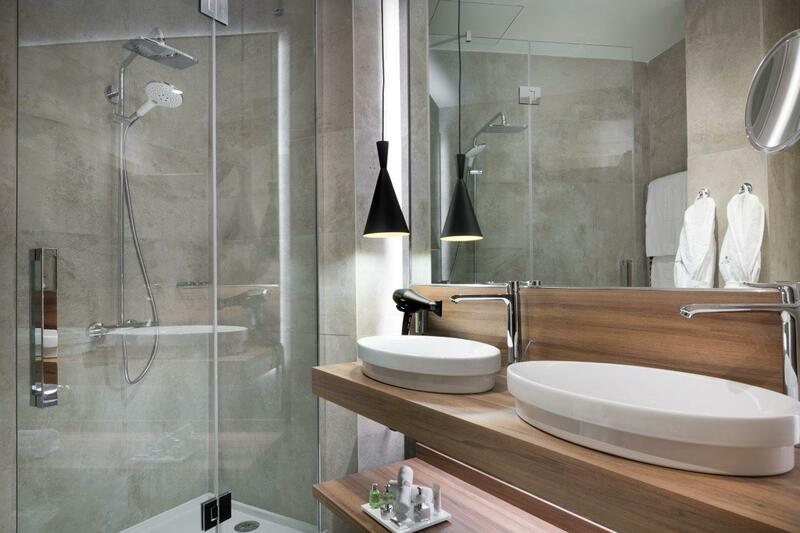 The bathroom had double wash basins, and a rainfall shower and handheld wand; but no tub. 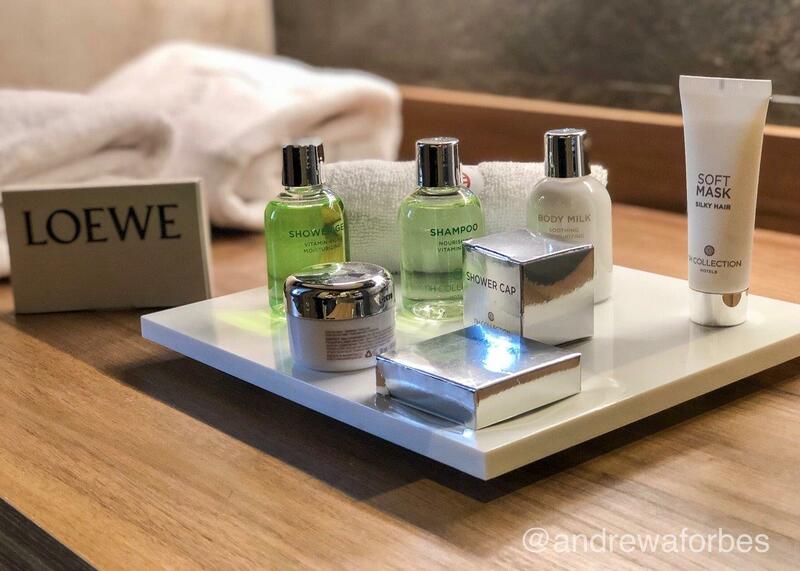 A generous selection of amenities included sample fragrances from Spanish luxury brand Loewe. Robe, slippers and plush towels completed the quality feel. I did notice that the hair dryer was professional quality one! I was offered a late check-out which was very handy. In fact, I understand that NH Hotels pride themselves of offering free early check-in and late check-outs whenever possible. If you’re planning a weekend escape, then you can expect a free late check out on Sunday, so you can really make the most of your stay. Family-friendly adjoining rooms are available, and an extra guest bed or cot can be arranged for a fee. The buffet breakfast was generous and served till 11am (noon at the weekend) in the Sky Garden (covered in winter, but still with fabulous views) and inside. Expect fresh fruit, cheeses, cured meats, cereals, breads; and, I am pleased to say, treats too. So often these days it’s hard to find a good buffet breakfast that offers naughty food as well as healthy. Let’s face it, that part of the fun of staying in a hotel is eating chocolate cake for breakfast! The team will be happy to prepare dishes a la carte too, so make sure you have time to relax and enjoy the first meal of the day. The 8th floor is where you can capture the urban energy of Madrid. 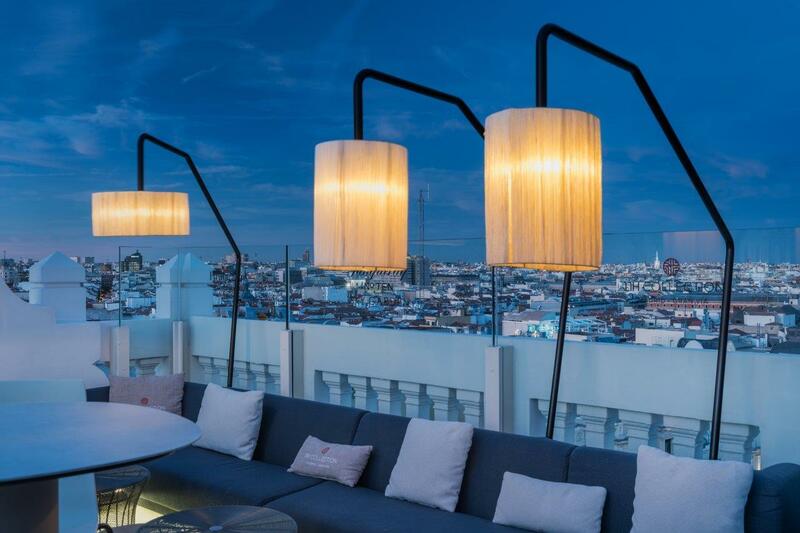 Here the hotel’s restaurant and sky bar, Picalagartos, attracts a smart, mixed crowd – guests, city slickers and millennials looking to enjoy cocktails with a view. Javier Muñoz-Calero, executive chef of the Azotea Group, is the talent behind the Mediterranean menu design, with classic Spanish produce such as fish, seafood (think delicious barbequed octopus and squid from the grill); and gourmet cured and roasted pork (roast suckling pig is a favourite in winter; and vegetarian dishes (try the grilled vegetables dish); – all prepared and served with a twist, using regional seasonal ingredients. 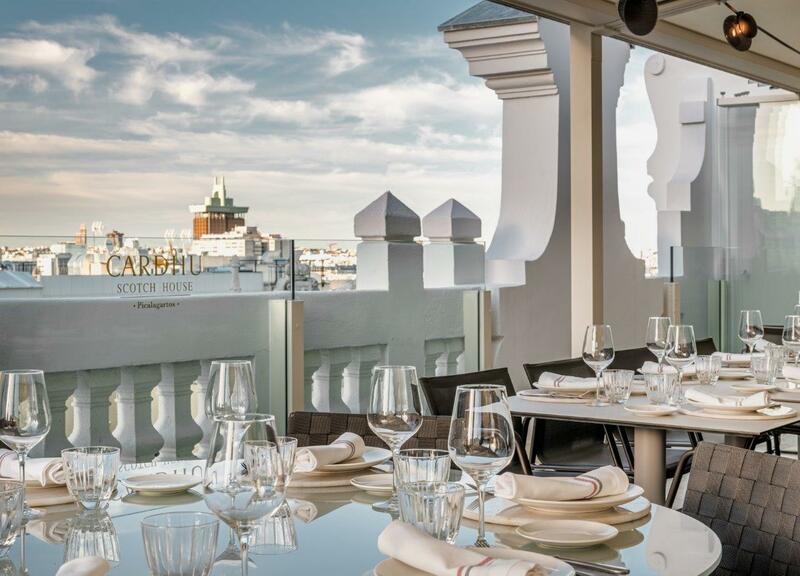 Even if you are not a guest, whilst in Madrid pop in for drinks, dinner with a view, or Sunday brunch. The 9th floor sky bar is the place for cocktails and tasty tapas like classic Gilda of olive, chilli and anchovy; or try the creamy ham croquettes. Yet since you are in Madrid you must try the fried potatoes, (patatas bravas) which here are Bravas Montera – crispy potatoes with sweet pepper oil, mild aioli garlic mayonnaise, and of the course the classic Madrid Brava tomato sauce, here with a tempting Smokey flavour. 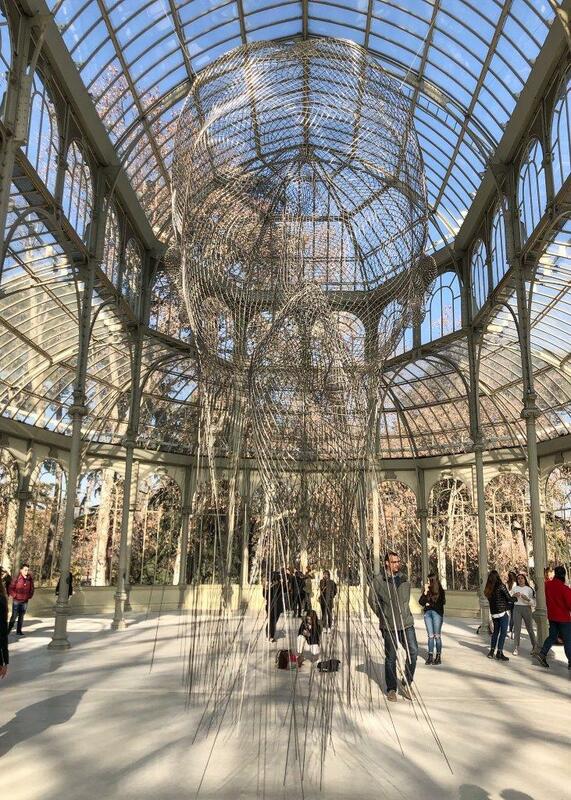 The guest relations team were on hand to help with information of what’s new in Madrid and suggest a few exhibitions, including the remarkable ‘Invisibles’ at the Palacio de Crystal in the Retiro Park. 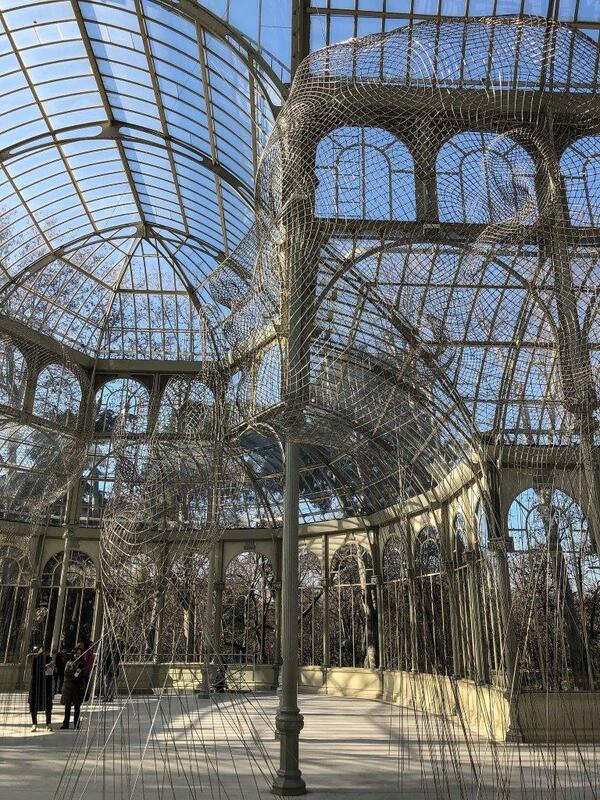 Artist Jaume Plensa has created some unique steel weft sculptures for the glass house that are so captivating. The hotel also offers bicycles for the guests who wish to explore further afield. Madrid in my experience is all about the city’s neighbourhoods, and its people. Madrid is a city that is best understood and enjoyed once you really explore. It is not a city of tourist attractions – it is a living, working, cultural capital. 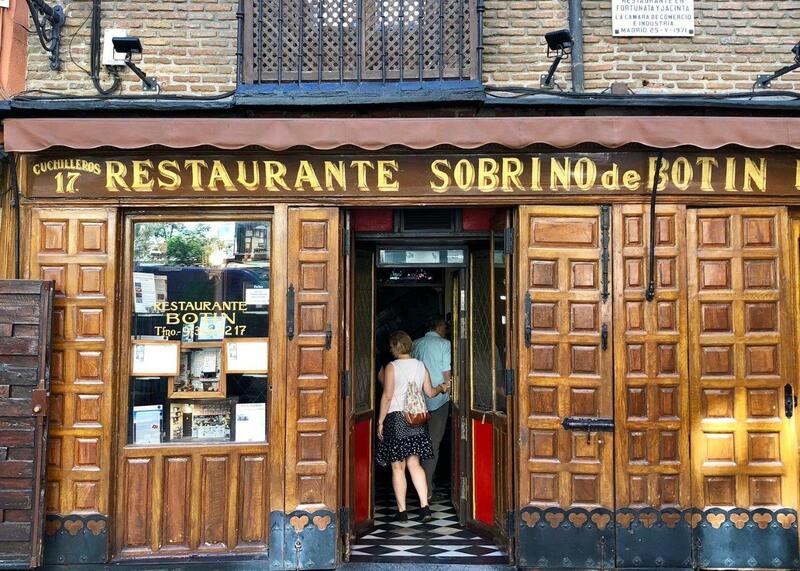 When I visit Madrid, I like joining a walking tour with Insiders Madrid. 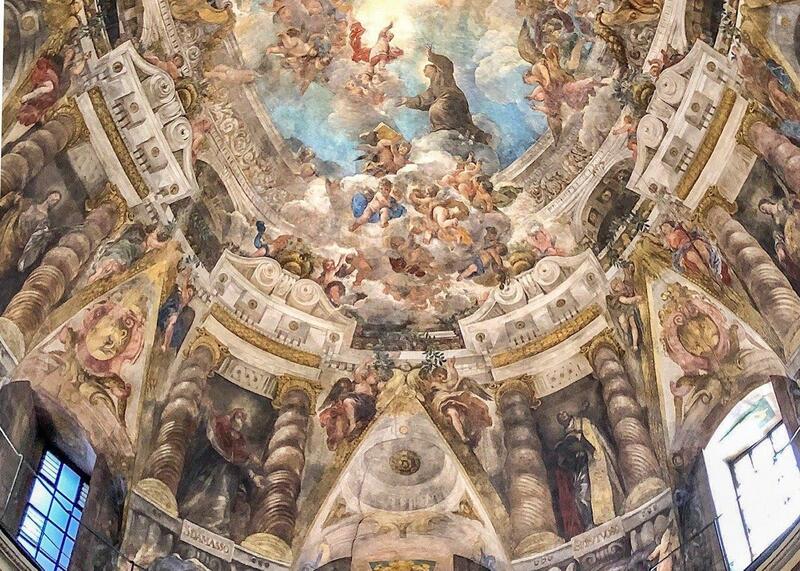 Founded by Joanna Wivell, this boutique travel company offers unique city experiences from gourmet tours, wines tastings, art tours to fascinating walking tours. Insiders Madrid offers a completely fresh and unique perspective to the city. You might visit a fashion designer in their studio; a guitar maker; or enjoy an insiders experience of the world’s oldest restaurant. NH Collection Hotels is a curated group of elite NH hotels found in notable destinations in Europe and the Americas.